First off, it was the book title that caught my eye: Chickens Eat Pasta made me chuckle.. What a clever and humorous title. Inventive too. Then how the author, Clare Pedrick became interested in moving to Italy intrigued me even further. Imagine being intrigued enough by seeing a chicken eat pasta to make a move to a new place, another country. It’s exactly what this young British woman, the author did. She uprooted herself to start a new life after watching a video showing a chicken eating spaghetti in a mediaeval hill village in central Italy. That in itself interested this life-long traveler. I knew it was a memoir and despite memoirs not really being my thing, I had to read this one. Fortunately, I enjoyed Chickens Eat Pasta beyond the title. Why? For one thing, Chickens Eats Pasta was cleverly written. It probably helped that the author is a journalist. And no, it isn’t a story about chickens eating pasta. No, it isn’t a cookbook either. The story begins with the author enduring another rainy, soggy day in England, and ends with her maiden Aunt Vi asking her the logical question, “How can you buy a house just because you’ve watched a video?” Good question, which this book does a great job in answering. Fortunately, the author studied Italian at Cambridge University before becoming a reporter. The funny thing about this book is that the author moved to a town that she had no idea where it was. 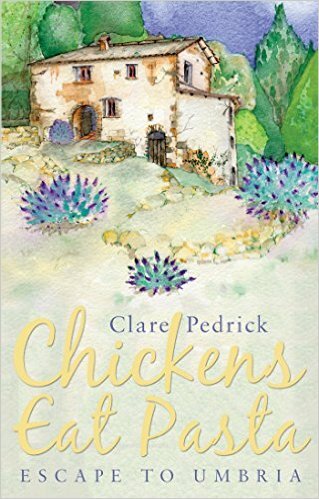 Chickens Eat Pasta by Clare Pedrick is a romance story, an interesting and satisfying read, but instead of the typical romance between two people, it was about her romance with an old house and the warmth and colors of Italy, specifically in the beautiful town of Umbria. Having been to Italy myself a few times, I can relate. 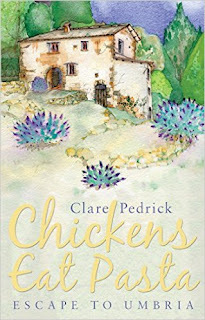 Chickens Eats Pasta by Clare Pedrick is a great tale. I’d personally label it autobiography, memoir, and travel journal. I really enjoyed this book and have no hesitation in recommending it to others. If you enjoy traveling, especially from the safety and comfort of your favorite arm chair, may I suggest you take a look at Chickens Eats Pasta?